I haven't been feeling well lately. I have had a sinus infection and the steroid that I am taking is keeping me up at nights. On the plus side, I have had a few hours each morning to work on an open source application that I am developing. It is nothing groundbreaking, just a simple utility that does a simple thing (more details later). I am releasing it under the GPLv3. I smile when I say that because this is my first open source project and I have been constantly impressed, since my introduction to Linux, that guys and girls all over the world write code and give it away freely to benefit anyone who can use or enhance it for their needs. It is this willingness to share and collaborate that has changed the world so dramatically over the past few years. It is an exciting time to be alive! My brother-in-law, Steven, and I went on an excellent backpacking trip over the weekend. 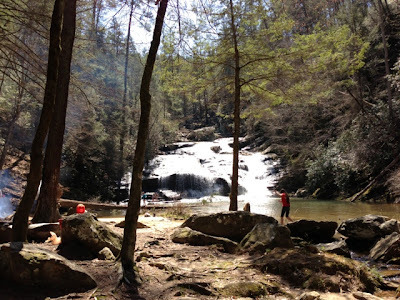 We hiked the Panther Creek Trail to Yonah Dam and back the next day. The terrain to the main attraction, Panther Creek Falls, is well marked with moderate terrain and just a few technical spots. The trail beyond the falls is the opposite. It is marked but, only in the opposite direction and isn't well maintained or frequently used. Unless you really want to see it, don't go all the way to the Dam. It is an extra 2 miles along a road (dirt for half and make a right onto paved for the rest). The park there is day use only and posted no camping. We were able to find one (unofficial) place to camp on the way back to the trail but, it was far from ideal. If you do want to go past the falls stop when you find Davidson Creek w/ a metal bridge and double back for camping or plan to camp in the parking lot or open “tree farm” field. Does anyone remember when the concept of "tagging" first hit the scene? No, I am not talking about spray paint on a dumpster. I am talking about the list of comma separated words, hash tags, or whatever to signify what the thing that you are working on is about. This post so far may be tagged: tagging, graffiti, pontification, etc. IIRC, it was hyped that tags were going to completely replace the folder metaphor. Instead of locking an item away in one category e.g. "Bills" like you would in a physical filing cabinet. You would classify them with more granularity e.g. "Bills", "Power", "Georgia Power". In actuality, they never replaced folders but, depending on the on the context, they can complement them. They can be used to great affect or, of course, be abused. My worst abuse of tagging, by far, is within Evernote. At present I have 464 tags. It is as if they don't have a search feature and that I am trying to index it all myself. Now, there are several quirks (read peeves or bugs) that contribute to my trouble within Evernote. For example, if you begin to type a tag and misspell it, both the corrected and misspelled words become tags because it creates the tag before you click save on the note. Within the last year or so, I have developed what I consider to be a productivity ninja habit of "Super Tags". I have a set of tags that I use everywhere. They are the collections of apps on my iPhone, folders for my web browser bookmarks, and becoming (hopefully) the main tags within Evernote as I wade through all of the detritus. I don't plan to use these exclusively but, primarily and I will use as few sub-tags as possible. At present, my "Super Tags" are: Health, Food, Travel, Productivity, Hobbies, Finance, Reference, Social, and Entertainment. I admit it, I have a tagging addiction. Keep me honest on this blog to help keep them to a minimum.